Okay, enough excuses and distractions that gave me reasons not to blog so I am "kickstarting" myself into action by sharing this Kickstarter for SolarPuff. As I write this blog there is less than 15 hours left in the campaign and SolarPuff has met its goal. However, I think its efforts to focus on Nepal is so worthy. There are so many areas that have not received aid. Nepal's mountains have small villages scattered everywhere, and the only access is by trekking paths that have been covered by landslides. Flying into and out of Nessing, one such village, many landslides were visible from the air. The people throughout this tiny nation need food, building supplies, and medical attention. Give, but be careful about to whom you make your donations. I had a post on FaceBook last week suggesting that if people were interested in contributing to Nepal's relief efforts, the North Shore Kauai Lions Foundation is receiving contributions. Michael Van De Veer, who passed away in 2006 was a Lions Club member, helped to establish a Kauai tie to Nepal. A life time advocate for social justice and peace, Michael used his ties with the Lions Club to get aid to Nepal, among the many other activities he was involved in to improve the quality of life for Nepali peoples. Wicki, his widow, tells me that she personally knows the members of the Lions Clubs in Kathmandu and feels comfortable that the money will make it to those in need and that these types of organizations are heavily relied on as the Nepali government is incapable of meeting social/medical needs. So please consider making a tax-deductible donation through the Kauai North Shore Lions Foundation, P.O. Box 985, Hanalei, HI 96714. 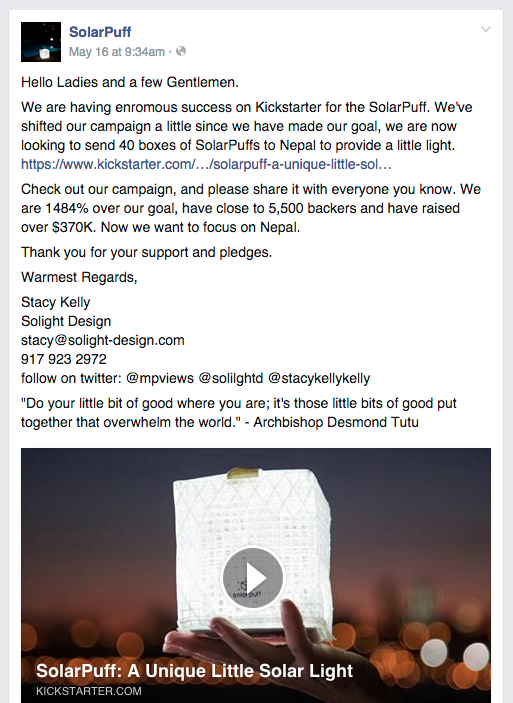 In the memo line of your check write "Nepal Earthquake" or send SolarPuffs to Nepal. In developing countries, clean drinking water and improving indoor air quality help to raise the standard of living. An implement like the SolarPuff can replace lighting requiring dirty and/or expensive fuel hugely improving indoor air quality and quality of life. But what is brilliant about the SolarPuff is its design. Just the aesthetics of it makes it a hot commodity and so marketable!